Today's defence related news includes coverage of the first female company Sgt Major at the Royal Military Academy Sandhurst (RMAS) WO2 Kelly Caswell Treen. The Telegraph, Daily Mail and the Times report on the interviews with Warrant Officer Class 2 Kelly Caswell Treen following her promotion to Company Sergeant Major at RMAS, the first female to hold such a role. 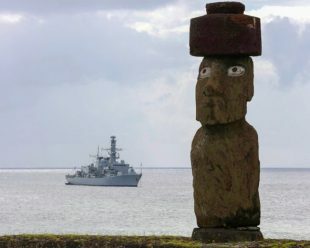 HMS Montrose Visited one of the wonders of the world which is Easter Island otherwise known as Rapa Nui, home of the famous Moi, huge stone statues that were made hundreds of years ago by the ancestors that lived on the island. There’s 1000 Moi on the island.